In A Most Noble Heir, forces work to keep the couple apart, and a solution to remain together seems further and further away. On the death of the only Mother he has ever known, Nolan’s whole life is turned upside down. He has always wanted to find out the true identity of his Father but when he does his whole world is changed. His Father is the Lord Stainsby that he had begun to hate! Nolan, who has only known the life of a servant, is thrown into the world of nobility – a world that he despises for their arrogance, wealth and air of superiority. While his Father tries to accept him, there is someone who clearly wants him gone. I fell in love with this unique story. 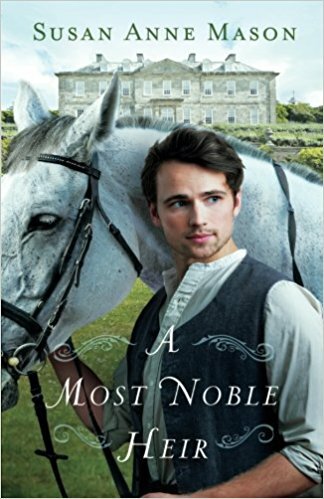 I really thought that Lord Stainsby would be more accepting of his son and the relationship he has with one of the servant girls considering his own personal history. I was disappointed at first but as the story goes on, you learn more about the Earl and you start to understand him better. It doesn’t make it easier at times to accept what he does to Nolan but it gives you a better glimpse into his inner mind workings. Nolan’s story was so unique and my heart went out to him as he struggled. He wants to be a good son and a good husband but the two worlds seem to keep clashing and then throw in someone wanting to get rid of him and you have a page turner. Nolan has to learn to control his emotions, his past hurts and his own pride if he wants to keep his marriage and build a relationship with his Father. No easy task for anyone and especially for the quick to anger Nolan who is still reeling from his Mother’s revelations. This is a beautiful story of faith, humility and second chances. I loved every moment of this well written novel. The characters and plot are well-developed and you have a hard time putting this book down as you become invested in Nolan. This entry was posted in book review, giveaway, Litfuse, Litfuse blog tour. Historical novels are great for not only taking you to a different time, but I always learn something too.